"Rather, we have renounced secret and shameful ways; we do not use deception, nor do we distort the word of God. On the contrary, by setting forth the truth plainly we commend ourselves to every man's conscience in the sight of God." Masks have often frightened me. I never liked wearing them even for Halloween. I found them suffocating, irritating and stifling. Even with a friendly face painted on them, I find them eerily disenchanting. They hide the truth of what lies beneath, whether the Beauty or the Beast. I find hidden agendas in people's speech to be like masks and just as frightening. In fact, I find hidden agendas loathsome. I've been caught in their web (not by my own doing) too many times, mostly on the receiving end. Quite frankly, it's deceitful. Whether it's happened in the workplace, within my church family, or at home, the result is the same... hurtfulness and pain. I suppose I can understand why people hide their agendas. In my experience, I've found people are either intimidated and want to test for possible reactions, or they desire an opinion on something before making their own committment. Either way, I find it disrespectful. If someone values a relationship there is no reason to hide behind a mask or approach someone with a hidden agenda. When this happens within church family it hinders the work of Christ not only within the personal relationship of the two involved, but also within the entire church body. Paul talks about the importance of the individual "jobs" or "body parts" in 1 Corinthians 12: 12-25. In order for our whole body to work well, each individual body part must function well. When one part is injured the whole body suffers. Made up of individual members, a church body can also only work as well as the individual relationships within that body. If we are to be the body of Christ, emulating His character, then should we not be honest with one another so as not to deceive one another or those on the outside? If our plans are God's plans, then there is no place for fear or deception. 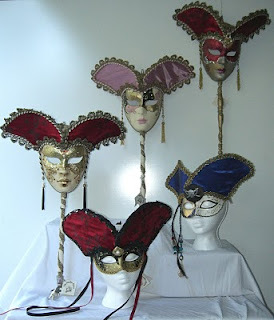 Let's stop the masquerade party and take off our masks. You, Miss Amy, are genuine! Love seeing your new pics online.